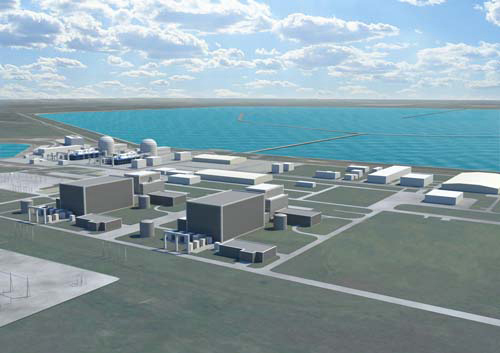 After three years of study, CPS Energy has recommended the expansion of the South Texas Project (STP) nuclear power plant as part of a diversified plan to meet San Antonio’s long-term electricity needs. The STP plant currently consists of two pressurized water reactors (PWRs), which together produce some 2700 MWe. The reactors were brought online in August 1988 and June 1989. The facility is operated by STP Nuclear Operating Co (STPNOC) and owned by NRG Texas (44%), CPS Energy (40%) and Austin Energy (16%). In September 2007, NRG and STPNOC filed with the Nuclear Regulatory Commission (NRC) an application for a combined construction and operating licence (COL) for two 1358 MWe GE-Hitachi ABWRs to come on line in 2014-15 at the STP site. However, having made revisions to the COL application, NRG now anticipates STP units 3 and 4 will come online in 2016 and 2017, respectively. CPS Energy CEO Milton Lee commented: "We've carefully examined many scenarios involving natural gas, coal, nuclear and even purchased power from the Texas grid to provide our community with a large-scale, long-term, cost-competitive source of electricity. We've concluded that expansion of STP has the highest probability of accomplishing that important goal." The total estimated cost of constructing two more reactors, each with a generating capacity of 1350 MWe, next the two existing units at STP is $10 billion, or $13 billion with financing, according to Steve Bartley, interim general manager at CPS Energy. Currently, CPS Energy and NRG are 50-50 partners in the STP 3 and 4 project, but CPS is now exploring ownership options that would reduce the financial impact on customers. This would reduce CPS Energy's share with financing to $5.2 billion. Bartley said that both NRG and CPS Energy are optimistic about finding a third partner for a 20% stake in the project. He added that CPS Energy may seek municipally-owned utilities and cooperatives to purchase some of the output from the company 40% share of the plant's electricity generation. "Any route we take will be expensive and will require bill increases," Bartley said. "We believe all methods of producing electricity will cost more as time goes on, so we are looking for the best way to slow cost escalation as much as possible and retain Greater San Antonio's position as having the lowest energy bills among the nation's 20 largest cities. In other words, we believe it's better to pay some sooner, that is, invest in STP 3 and 4 to avoid paying a lot more in the long run." He said that funding the construction of STP 3 and 4 will require increases of no more than 5% annually to customer electric bills beginning in 2010 and continuing at intervals until the expansion is completed in 2016 and 2017. Bartley noted, "Even if we decide not to participate in STP expansion, we will still need customer bill increases to meet the demands of growth on our system." Bartley said that more nuclear-generated electricity is compatible with CPS Energy's Strategic Energy Plan, which calls for pursuing energy conservation/efficiency; increasing the supply of renewable energy; supplying low-cost, competitive electric power; and maintaining the company’s environmental commitment. He noted, "Much of our Strategic Energy Plan is focused on sustainability. In fact, our financial commitment to sustainability through 2020 is $5.7 billion, which is more than our estimated investment in STP 3 and 4." In a statement, CPS Energy said, "With recommendation and cost estimate in hand, the board now plans to conduct a summer-long public education and input process before making a decision on STP 3 and 4 in September." It added, "If approved, the proposal to expand STP would then go to the San Antonio City Council for final consideration in October."